This past weekend I ran away from home. After months of pushing really hard in my business and personal life, I was hitting a massive wall. It was hard to admit at first, after all - I just home from a week in Punta Cana with my family, and the weekend before that trip I was at an art retreat. But as most parents know, a vacation with three children is not "relaxing." I put a lot of pressure on that trip to help me unwind and relax. I should have known better, I've been on trips like that before. While the kids are now old enough to not require me to be ON the entire time, we still had to coordinate a lot of people to do a lot of things, and they're still kids with a lot of energy and a lot of feelings. I was so tired on that trip that between activities I didn't even have the energy to read a book, and I came home even more tired than when I left. 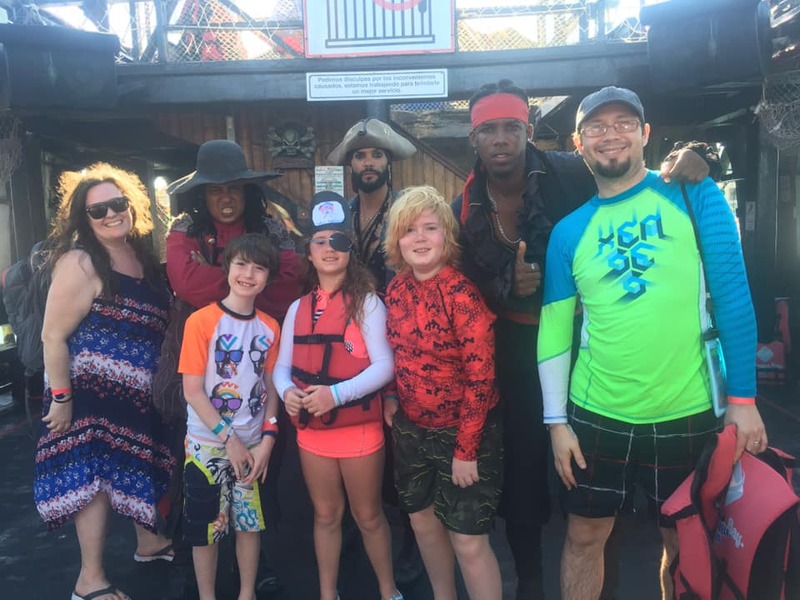 Meeting these pirates was a super fun highlight of our trip to the Dominican Republic! As an introvert, transitioning to homeschooling my son has meant that I don't have much alone time - and I had been alone for most of the week for the previous six years so this has been a big shift and change for me. I felt tired ALL the time. I didn't feel like I was thinking clearly any more. I was not working well as a mom or as a business owner. I was nearing burnout - but it was really hard to admit that when I felt like so many things were going so right. Can you burnout doing things you love? Have you heard people say, “do what you love and it never feels like work.” It’s not true. You can love what you do and still get really tired and burn out from it if you’re not careful. So, I left Friday afternoon and headed up to the family cottage (which I'm grateful to have access to when needed, but happily would have rented one or an Airbnb for the weekend) and just stopped. I took a three-hour nap that went right through dinner time. I slept whenever I felt tired. I had meals whenever I felt like it - 11 am, 3 pm, 9 pm. I ate what I felt like eating whenever I felt like it. I stared out the window at the trees and the water. I didn't intend to work but I didn't intend to NOT work. The more I sank into nothing, the more my brain woke up. New ideas popped into my head. I felt excited about things I haven't felt excited about in a while. I had the bandwidth to contemplate next steps instead of feeling required to do it. What does self-care look like for you? We don't all need the same things to take care of ourselves, but we all need to make sure that we stop and think about what works and what doesn't, and we need to make sure we’re not getting too caught up in how we think we SHOULD be feeling and operating. I work better and smarter when I have more time by myself doing nothing. It's not being lazy or self-indulgent, it's being productive and poised to take on the world. Moving forward I will guard time for myself even more. I blocked off time in my calendar years ago for quiet and down time but over the last couple of years I filled ALL of that time with parenting stuff and/or appointments for myself to work on my health. Important, but not actually the down and quiet rest time I need. So I'm re-jigging my schedule again, this time to accommodate for parenting time, health time, and ME time. If I want to be productive and effective in my work, this is mandatory; even though it feels counterintuitive to work less to make more money. We've been taught that the only way to make more money and achieve more success is to work HARDER. As someone who has never worked effectively on a traditional timeline, I need to keep reminding myself that doesn’t work for me. When's the last time you did something to help yourself this way? Do people know who are you? What you're selling in your business? Who you work with? Why they should buy from you? Getting visible online is something a lot of business owners really struggle with, but it's also one of the very best ways to be seen. To be known. To get more clients. To make more money. When you're visible you can share your experience, your expertise, and give your audience the opportunity to get to know you. This is how you build relationships. You're creating the "know, like and trust" factor, which is how many people choose what to buy and who to buy it from. Here's the good news. You don’t need to be a social media expert to make social media work for your business - you just need to be visible on it! The bad news? Visibility is often something business owners have a really hard time with. You may find yourself shying away from posting online too much or not wanting to share too many photos, personal stories or selfies. So, how can you get comfortable and start taking action so that people can see you, your business, and all of the value you have to offer? Be visible. And if that feels hard, get more comfortable with being visible in a safe space designed just for that - my visibility challenge. I want to support business owners as they talk about their mindset. I want them to be more comfortable posting in a variety of places online, dabble with video and even start thinking about getting media attention. Let's get you in front of more people so more people have the opportunity to start working with you! Are you ready to attract your ideal clients? Together let's get more active in the online space, share relevant content, and build relationships with the people in your networks. That is how you stay top of mind, which is what visibility is all about. So, sign up for my visibility challenge. It takes about 5-20 minutes per day (some days less!) over 14 days. We'll start getting comfortable, setting up good visibility tactics and building relationships with each other at the same time. Let's get visible together! See you over there! A lot of the business owners I work with come to me because they feel frustrated. They have goals they want to achieve but they're not achieving them because they lack the focus, clarity, and accountability to do it. Some business owners are “all in” when it comes to clarity, accountability and reaching goals. They invest in a mastermind program or business coach and devote the time required to work on growing their businesses. But then we have the "little bit in" business owners (and they're the more common ones). The “little bit in” business owners want change and growth in their businesses, but they spend so much time working IN their businesses (and believing there just isn't the time to step away) that they never make the time needed to properly plan, strategize or do the work needed to reach their business goals. It’s really easy to be the “little bit in” person. You sign up for an online course and rarely or never participate in it, you join Facebook Groups and read everyone else’s posts, but never engage or you follow a business coach online, but never commit to signing up to work with them. The “little bit in” person doesn’t want to invest in a private package or high ticket price business coach full time, or they sign up for things and don't execute on any of it for a million reasons that feel very legitimate and honourable. We all have a lot going on and if you don’t invest the time needed to fully plan your business and work with someone who can help you reach your business goals then you will always be that “little bit in” person. You will never accomplish anything outside of your day-to-day unless you commit to taking a break and blocking off the time to do so. * You need to take time away from your business to figure out what is next. * You need to take a step back from the day-to-day and see what is working and what is not. Whether it is through an accountability group, a business coach or another commitment – you need to go all in for yourself and your business in order to see change and grow. The next time you feel the need to do something big in your business think about what it would take for you to be all in and not just dipping your toes in? 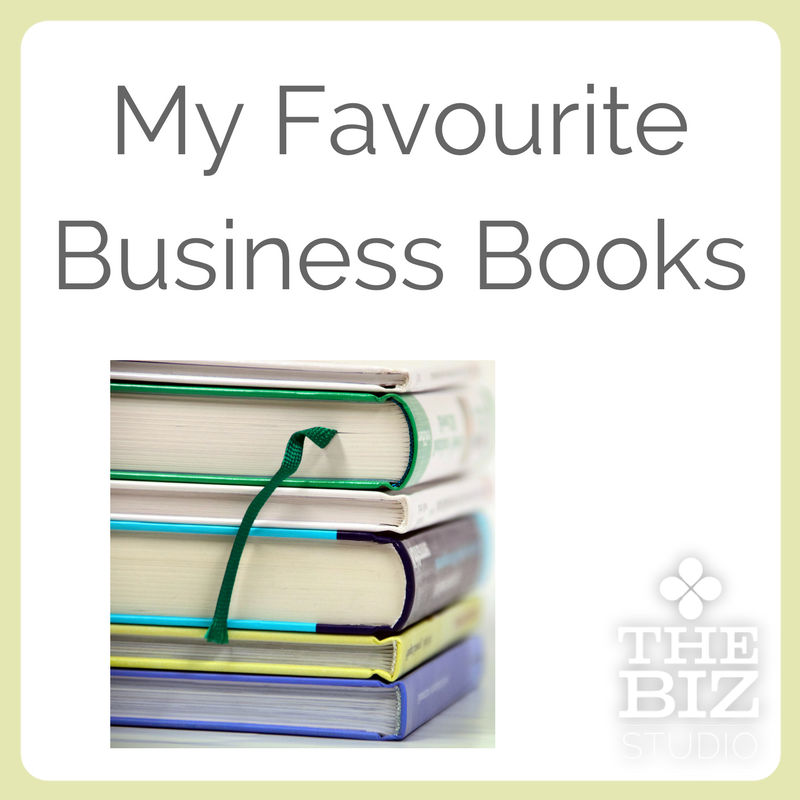 How can you stop being the “little bit in” person and grow as a person and as a business? What would that do for you and your business? Is it worth it? Ponder this and then leave me a comment and let me know how you make big changes and grow in your business. When you're ready to go all in, book a call with me or come and join the Biz Advantage. We're there and ready to help support you as you start making real things happen! I use many tools to keep my business running and I am always honest about what works and doesn't work for me. These are some of the tools I use to keep my business running smoothly, as well as services I use for things like printing and marketing products. Acuity Scheduling - This tool gives current and prospective clients the freedom to schedule their own appointments with me based on the availability I pre-set up through my linked calendar. I also link Acuity to Zoom (my video chat software, which I mention a little later) so when someone books a call they automatically have a Zoom ID generated, which creates and sends the call information manually (this is a huge timesaver for me!). I also create custom forms for each appointment. This allows me to create different sets of questions depending on what we're meeting about. These questions give both me and the client or prospective client as much information as possible about each other, and the topic at hand, before we get on the call. Freedcamp - There are many great project management tools out there. It's important to find the one that works best for you. I like the fact that in Freedcamp I can drag things around (probably because it's a lot like Post-it Notes and that's how my brain works). Project management tools are a great way to manage multiple projects at the same time, set deadlines and work with a virtual assistant or team to accomplish those goals and tasks. Lastpass - passwords, you shouldn't use the same one everywhere but how are you supposed to remember all the passwords? A post it on your computer is not only not the best idea, it's easy to lose and not at all useful if you're logging in to something when you aren't at home. I love lastpass because it saves all my passwords and also creates secure passwords for me to use. It also lets me share passwords with my team, either so they can see the password or so they don't know what the password is - very handy! Quickbooks - Quickbooks is what I use for invoicing and it also helps me track all expenses and HST so I can easily file my taxes. I like that it's got a fairly simple interface and that it has the ability to deal with far more complex things than I'm doing now so it will grow with my business. Moonclerk - Moonclerk connects with Stripe and it allows me to be able to auto process monthly membership payments. This is how members from the Biz Advantage pay their recurring membership fees even though I don't formally have a shopping cart system that has that functionality. Stripe - Stripe is a great alternative to PayPal for accepting payments. It integrates with a lot of softwares and websites, including my website shopping cart that is through Squarespace. Active Campaign - Sending emails is really important for any business. There are so many options with many different functionalities. Active Campaign is a good fit for my business because it is affordable and gives me the ability to not only create automations, but also to separate clients on multiple lists and the ability to tag customers so they won't get emails trying to sell them into a program they are already invested in. Belive.tv - This is a fun tool for running Facebook Lives and they have a two week trial. You can easily add branding to your Facebook Lives and you can pre-schedule headers to pop up, making your broadcast look slick and professional. You can also have multiple people on a Live at the same time without having to use your phone, something I don't have a great set up to do, so try to avoid. Buffer - Scheduling content may not be the best way to get engagement on social channels, but it is definitely the easiest way to make sure there is always consistent content being shared to your channels. There are lots of great programs for scheduling content. I have been a longtime user of Buffer and like the clean look of it and it's ease of use. Zoom - If I were only allowed to keep one tool in my business, I would keep Zoom, that's how much I love and appreciate this software. Zoom is an amazing platform for video calls and it is how I run 99% of my coaching calls. It allows me to record the calls, and it allows me to give permission to my clients to also record the call. It allows screen sharing and I can use it as an informal webinar tool too, which has come in handy several times. Having previously used other video chat softwares, Zoom is infinitely more stable as a platform and has far less connectivity issues than any other video software tool I've ever used. Moo - I love getting my business cards from Moo. I can upload up to 100 different photos! They become almost like trading cards. ;) People love that there's a photo on my business cards. They remember who I am, and they love getting to pick which card they want, so it becomes this great conversation starter and it makes conversations more memorable because the card is something they don't want to get rid of. This link will get you $10 off your first order. Canva - Creating attractive images for your business is something that is no longer optional, it's required. You are expected to share images with blog posts to get people's attention online. If you're not a professional graphic designer (like me) this might feel VERY stressful. I love that Canva makes it really easy to try different things and that they have all kinds of templates. I know that I'm not creating something TERRIBLE (and trust me, I used to try to create images in MS Paint - they were TERRIBLE!)! 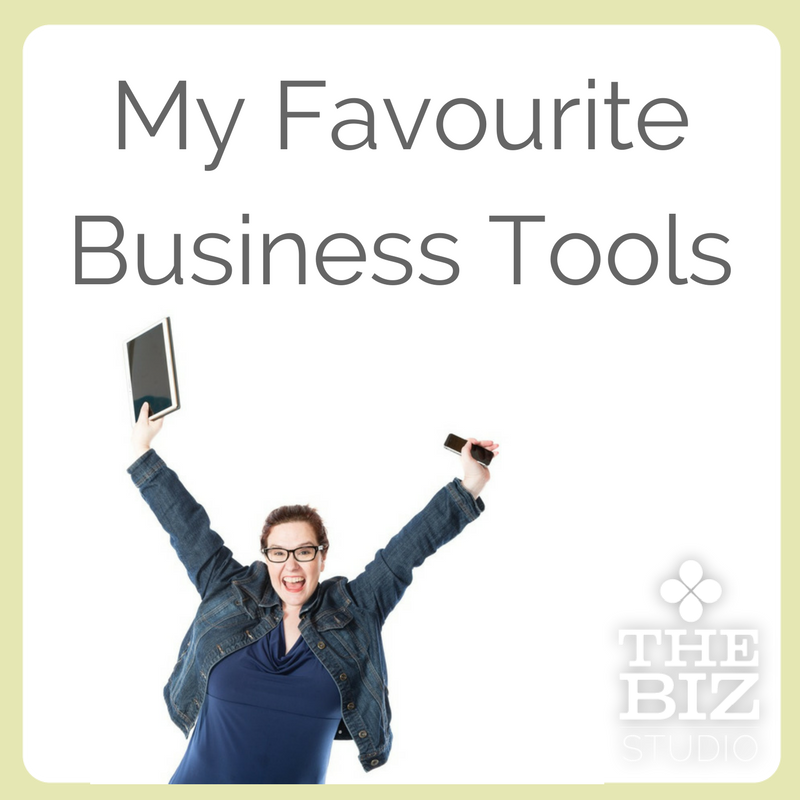 There you have it - a list of the important tools that I use in my business. Are there others that are critical to your business? Let me know in the comments below. If you want people to pay attention to you in this very busy, loud and overwhelming world then there is one thing you need to make sure you always do - PROVIDE VALUE. People will only make time for things they really WANT, so it's your job to understand your audience enough to have figured out what they want. Can you describe your audience? Every audience is different and you need to take the time to really figure out who your audience is. Understanding who makes up that audience, what they like, what they don’t like and what they would like from you is critical in creating the kind of content that can help you build relationships that turn your audience into customers. Nobody likes to follow a brand that is only trying to sell to them. 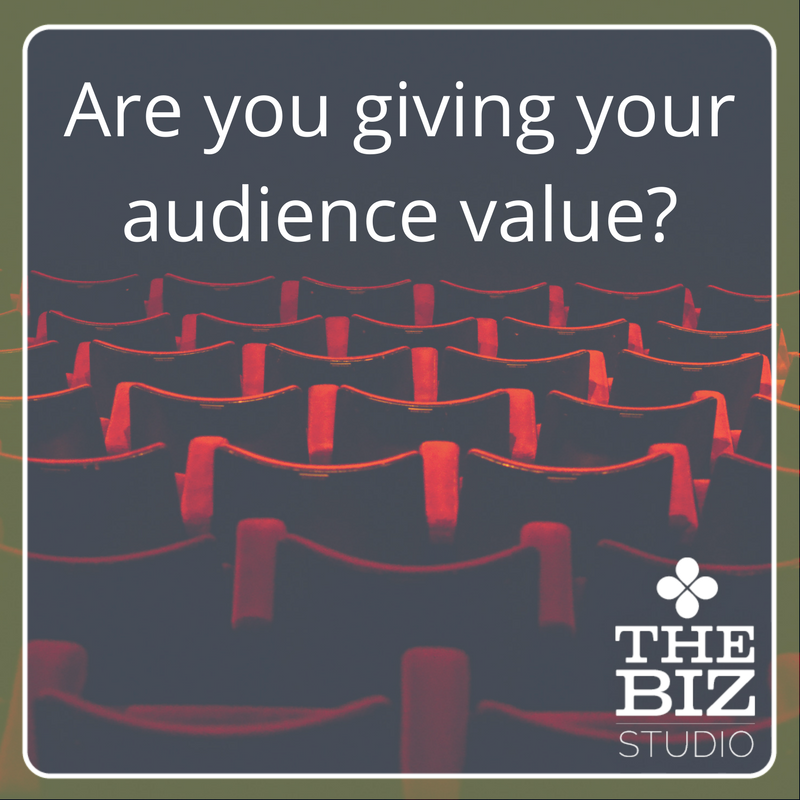 That’s valuable to the brand, not to the audience. Make sure that you’re giving your audience something they want or can use so that when you do post some sales posts - and you definitely should - they think so highly of you they’re far more inclined to buy. If your main audience is young women about to get married, interesting articles about retirement doesn’t make sense. If your main audience is men who want to home brew their own beer, then funny cartoons about being a new mom doesn’t make sense. Where and how do they want to receive information? Where do your people like to hang out? If they're on Instagram, creating podcasts is never going to work well for them. If they're on YouTube, they want video, so you want to make sure you're creating video. If they love really clean design you're going to be creating different things than if they really like stories. The more you understand what format they like to receive content in, what they want to know, and where they want to receive it, the more likely your content will hit the mark and connect with them. Spend some time thinking about your content and what you’re giving to your audience that they would value. Then share some examples (good and bad) of what you’ve seen or done that relates to giving an audience value in the comments. 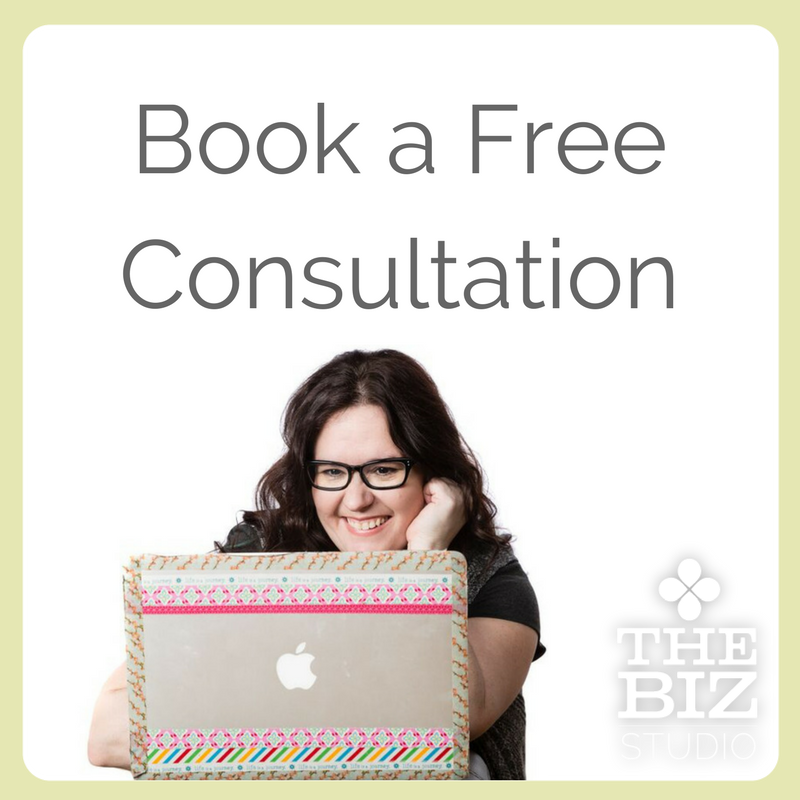 If you'd like help finding ways to share content online so people are ready to pay attention, come and join my free Facebook Group - The Biz Studio Community. There's a free cheat sheet in the files section with templates to use to highlight the benefit and value of your content when you share it (because even more than providing valuable content, you need to also make sure you're telling people what you're sharing and how it's valuable).